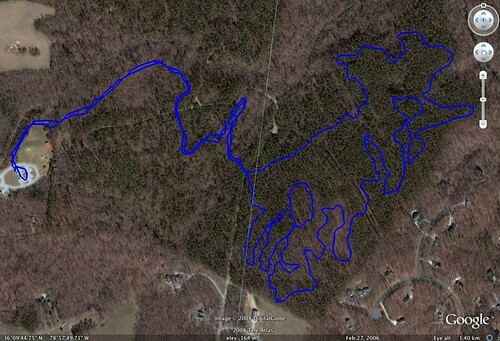 Little River mountain bike trail - To grrr, or not to grrr? That is the question. Dana and I hit the Little River trail just northwest of Durham this morning. Glad we started out early with this awful heat. It was already close to 80°F by the time we started. It was not quite as bad in the trees, but there was no wind at all. Even on some of the fast parts helped some, but the air was so thick with humidity and stagnant that it didn't help all that much. We were so glad when the trail was over as the heat was just that bad by the time we were done and I had little reserves. A dog on a leash? My intestines this past week? I really, really want a personal, portable GPS device. Not now. It's on the luxury list. Yep, I did want to capture some pics of Dana, but it was just too damn hot though. I'm sure I would have had the camera covered in sweat.